BILLINGS — A 10-mile section of the Bighorn River northeast of Fort Smith may close to float fishing in January for removal of an abandoned Phillips 66 oil pipeline. The eight-inch-diameter underground Seminoe pipeline, operated by Phillips 66 Pipeline LLC, is nearly exposed where it crosses the Bighorn River about six miles northeast of Fort Smith, between the Three Mile and Bighorn fishing access sites. The crossing is about a quarter of a mile below the exit of the Picture Channel. Phillips 66 Pipeline started a project Oct. 1 to replace 275 feet of the pipe, where it crosses the Bighorn River, with a new line that is buried deeper. That project involves directional drilling to some 40 feet below the riverbed and will not affect boat traffic on the river. However, the Montana Department Natural Resources and Conservation is requiring Phillips 66 Pipeline to remove the abandoned section of pipe. The petroleum company plans to hook onto the old section of pipe from shore with a trackhoe and pull it out from beneath the riverbed. If that does not work, contractors plan to build temporary rock ramps and an 80-foot-wide pad on the riverbed to accommodate excavation equipment. The company contractors then would dig three to five feet of rock and soil out of the riverbed to expose the pipeline so they can pull it to shore. 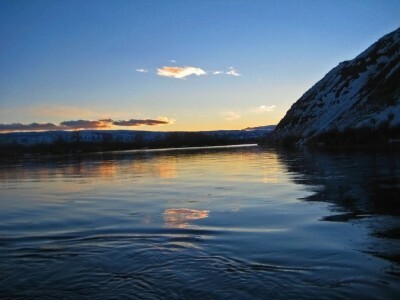 If Phillips 66 Pipeline activates the latter plan, Montana Fish, Wildlife and Parks will close the 10 mile stretch of the Bighorn River between the Three Mile and Bighorn fishing access sites to boats for about two days for the safety of both construction contractors and anglers. Fishing from shore would not be limited, except in the immediate area of the construction. Phillips 66 Pipeline contractors will start staging equipment on private land at the site starting Jan. 2. They plan to start work in the river channel around Jan. 7 and wrap up all work by Jan. 12. If a river closure is required, Phillips 66 Pipeline will give state agencies and anglers 48 hours of notice, which will be posted on FWP’s web site and elsewhere. The company also will post closure signs at the Afterbay and Three Mile fishing access sites and immediately upstream from the work site.